Mother Neff State Park was the first official state park in Texas. 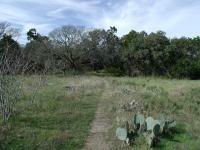 Isabella Eleanor Neff, mother of Texas Governor Pat M. Neff, donated the initial six acres of land that would form the nucleus of the park. Later donations increased the park size to 259 acres. 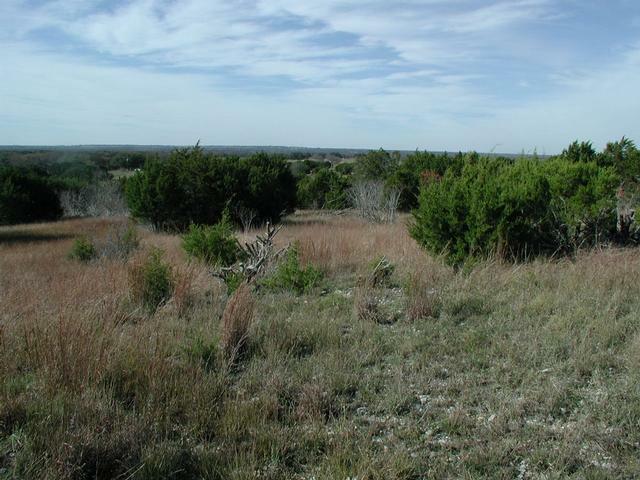 While not large by state park standards, Mother Neff is a thin rectangle that dissects the landscape, offering a variety of terrain and vegetation that often can not be found in parks several times its size. In the rocky creek canyon portion of the hike the terrain can be steep, but such spots are not too numerous. 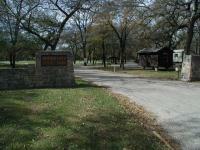 The "Lost Trail" trailhead can be found behind the ranger station near the entrance to the park and is marked on the map by the "Trailhead" waypoint. The route we took will venture to the back of the park by as direct a route as possible and then visit some of the interesting side trails on the return journey back to the trailhead. One word of caution concerning the official state park map. Due to the long, narrow shape of the park and the size of the paper on which the official park map was printed the trails got compressed somewhat and they appear to sway back and forth across the terrain more so than they really do. Refer to both our topo map and the park map to arrive at something more close to the actual truth. The trail begins in the easy terrain of the park's river bottom lands. Here one can find an abundance of large Cedar Elms and other trees that enjoy the rich soil and close proximity to moisture. It's easy to make fast progress over this portion of the trail as the land is flat and the large trees are well separated from each other. 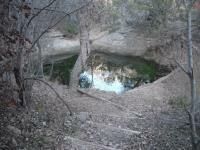 As the trail enters the small creek canyon that empties to the south the terrain changes. Here one finds more Oaks and Junipers, those trees and shrubs that can handle the rough and rocky terrain that predominates this portion of the park. 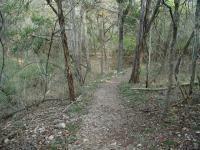 The nature of the trail itself also changes as the going becomes a bit more challenging. Flat dirt trails give way to short, but rocky, ascents and descents. The Junipers close in on the trail more so than the hard woods along the river bottom. The trail is in great shape and bridges, such as this one, make crossing the creek easy. 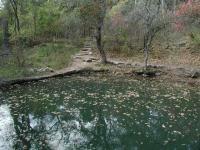 The waypoint "Wash Pond" is one of two great places to stop along the trail for a rest. 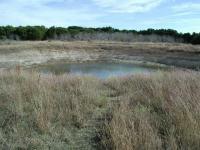 This small natural bowl is fed by water runoff and by a small spring that can occasionally be seen bubbling after rains. Sitting on the steep rock slope of one side of the pond and enjoying the cool breeze sifting through the trees we felt at ease and alone, but we weren't. After several minutes our eyes met those of a staring, perfectly still frog just two feet away along the edge of the water. 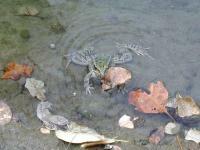 Only later, when it was time to continue to hike and we got up did the frog dart under water and under a rock. As you near the waypoint "4-L" you'll encounter the third, and largest, ecological area of the park, the prairie. On the day of our visit the area was beset by high winds. While in the relative shelter of the river bottom and canyon lands below, the effect of the wind was barely felt. Here on the prairie a hat strap and a firm hand on the trail map were the only thing that kept gear from being blown into the next county. Despite the high winds, breaking out into the prairie was a refreshing change. 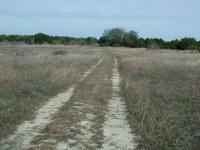 The wide open terrain provides for sweeping views, which will become more prominent later in the hike. The trail leads almost straight back to the corner of the park. 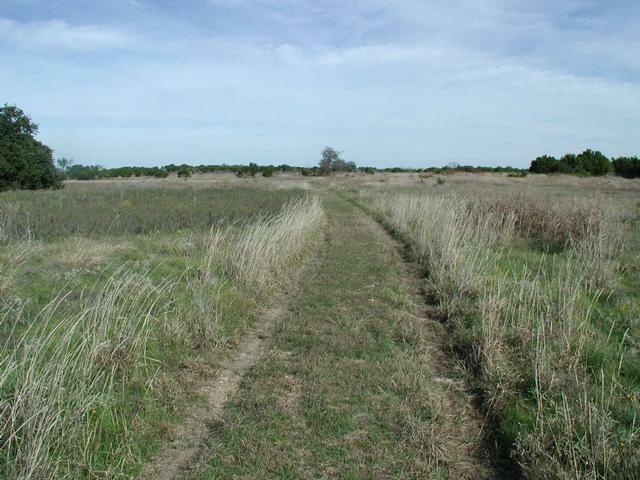 A spur trail leads to a primitive camping area near the waypoint "Pond". The main trail continues uphill to the waypoint "Lookout", near the highest point in the park. 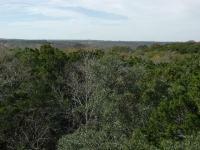 From this vantage point sweeping views to the south provide a glimpse of landscape for miles. Under more ideal conditions this location would make an excellent spot for a picnic. 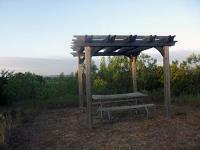 The overlook lies near the high point of the park and provides sweeping views to the south, over the park lowlands. The lookout marks the turnaround point for the hike. On the way back we'll try and hit the three main sites that make Mother Neff State Park unique and we'll attempt to cover as many as yet un-hiked paths as possible. After descending from the park highpoint follow the trail towards the southwest toward the "Alt-Trailhead" waypoint. Here a parking area allows for those who do not wish to hike the length of the park to enjoy the lookout without too strenuous a trip. "Ruins" marks the spot at which one can find reminders of the park's day as a working ranch. 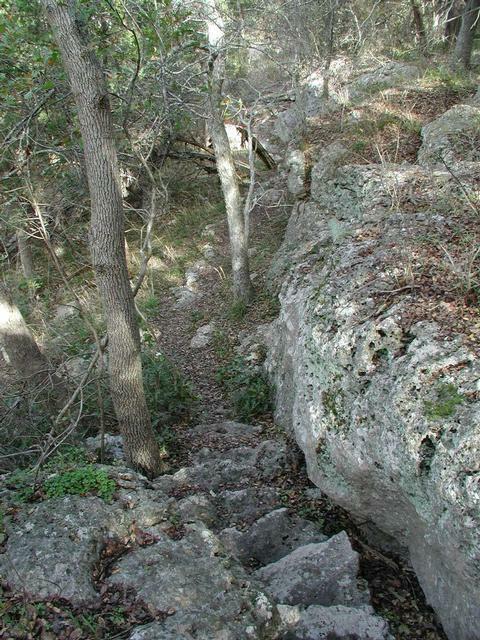 Soon after passing by the rock structures keep a careful eye out for the return trail to the right. It's not that easy to spot coming from this direction and you could easily find yourself back in the heart of the prairie. The distinctive rock water tower is the signature structure of the park. 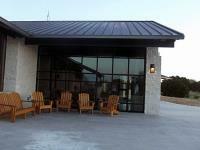 It also provides a platform for overlooking the surrounding area. 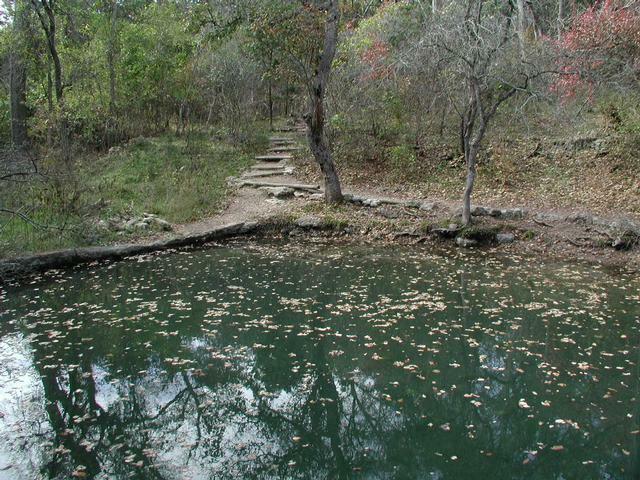 Back at the Wash Pond we cross over the small dam and ascend the rock stairs on the opposite side. The trail here will parallel the path we took on the initial half of the hike back to the waypoint "Y-R". A side trail leads to the waypoint "Rock Tower", which represents the signature structure of the park. 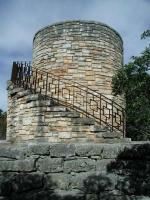 The Civilian Conservation Corps built the water tower in the 1930's and added a spiral staircase to the design to provide yet another high vantage point in the park. The cave served as shelter for the local Indians. 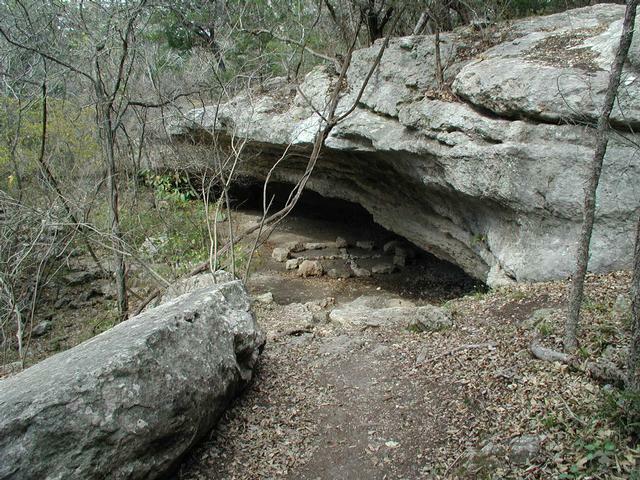 The cave at the end of the last side trail marks the spot of a natural rock overhang that had been used for years by local Indians. During CCC operations in the park the remains of three Indians were found. Two of them were reburied in a nearby cemetery. 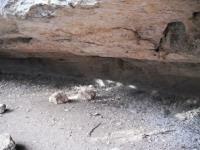 The third was reinterred under the rock overhang and marked by a plaque. Unfortunately, in 1969 someone raided the grave and stole the marker, which was never replaced. The rest of the hike from this point is a simple return by the most direct route to the trailhead. In all the entire trip covered just over 4 miles and was covered in 3 hours and 13 minutes. The elongated shape of Mother Neff State Park provides an enlightening view of multiple ecological regions, providing some natural insight to go along with a good hike. The actual solitude of the trail is difficult to gauge as our visit occurred on a non-holiday Monday. We encountered no other person on or along the trail the entire day, though this is certainly not the norm on weekends. At times the trail does pass close to roads outside and inside the park, so while our hike provided solitude, it's not a wilderness experience. 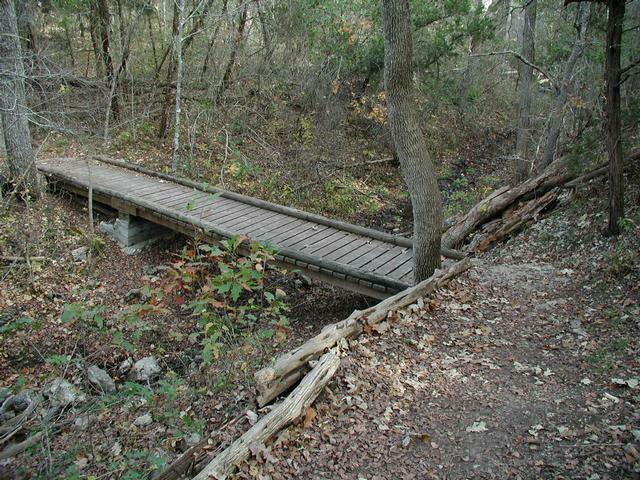 According to reports, the ADA (wheelchair) accessible parts of the trails are include the Prairie Trail (to primitive campsite) and the Bluff Trail Loop (cannot take path to wash pond). There were people camping there but they weren't out on the trails. We had them to ourselves. The South end was still flooded so we did loops in the North End. Overall it is a nice trail system well maintained and marked. The park like most in the area suffered damage from the flood a couple of years ago and still is not back to full capaicty. The buldings are cool as they are the old CCC built types and the water tower is awesome. Overall good for the kids. This is a great hike with pretty neat features close together. We went initially out to the Prairie trail and were very disappointed, It was featureless with limited views and the trail is a dirt road. We took a look at the map and went back to the parking area closest to the end of the road and found the Wash Pond . It had just rained and the small waterfall was running and set a beautiful scene. From there we made our way to the Rock Tower and had a picnic lunch at the foot of the tower. 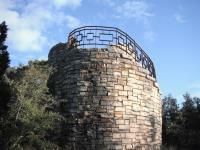 The Rock Tower is the highlight and the trail leading up to it is isolated and a makes a great trail. 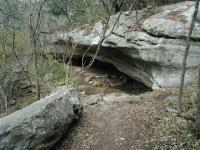 Also the cave is a neat feature but the trail there was pretty overgrown with poison ivy. We were all alone on the trails and I would have rated it a 5 but in places you can hear the highway traffic loudly. This was a nice, relatively easy hike. I didn't see the trailhead by the entrance, so hiked this backwards. We went on a weekday and didn't see anyone else on the trails. It was very enjoyable! 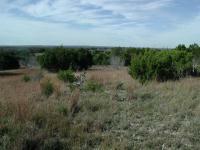 Went to the Neff Trails today to pick up some caches. ran into a lot of people on the trail today enjying the great weather.Visit our State Parks before they're all gone.Only YOU can save our State Parks by using them!